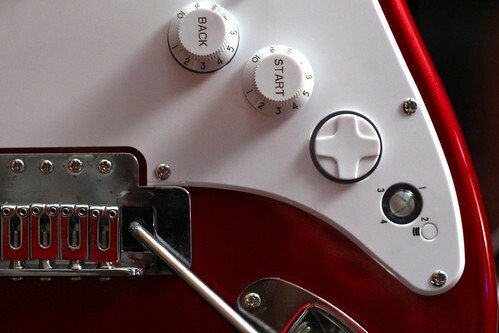 A close-up look at the full-size replica Fender Stratocaster controller that I use for Rock Band. Fender actually makes the body and does the paint job, and I've gotten so used to the weight of it that I can no longer even feel the weight of the regular controllers. I wish it didn't have the clicky strum bar, though. I actually "scouted" this shot a week or two ago with my phone, which is a technique that I will have to try more often, as it allows me to "bank" some subject/composition creativity for later use.